Found items can be handed in at all Citizens Registration Offices (Bürgerämter) in Heidelberg or directly at Heidelberger Dienste, Hospitalstr. 5, 69115 Heidelberg. 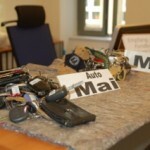 The collection of items is only possible at Heidelberger Dienste (Lost and Found). Bulky items are accepted and stored at the recycling yard (Oftersheimer Weg 1, 69124 Heidelberg). Please make sure to contact the lost-and-found office first to find out where to pick up the found item exactly. This way you’ll save time and unnecessary travel. If you found a bicycle, please contact the nearest police station first in order to figure out whether the bicycle has been reported stolen. Lost properties will be stored for six months. After this period has expired, the finder canbe informed and is allowed to pick up and keep the found item against payment of an administrative fee. If the finder decides not to keep the found item, it is going to be utilized or put up for auction. In case of delivery of found items, the owner must prove his ownership (An identification card is necessary!) The finder will be charged with an administrative fee (from 2,50 Euro to not more than ten percent of the item’s time value).